Gustiamo never stops! Not long after our extra virgin olive oil adventure in Molise, we headed north to Parma. Our visit to Cibus 2014 was a whirlwind of a trip, but absolutely fantastic and full of excellent food and amazing people. We started our visit chatting with Rosalba and Alessandro from La Valletta (top left). What did we talk about? Farro! They shared with us a classic and simple recipe from their kitchen growing up. Keep your eyes peeled for this farro recipe coming soon to the GustiBlog. Over in Ligura (Cibus Liguria, that is) we met up with mother and daughter team Claretta and Luana. 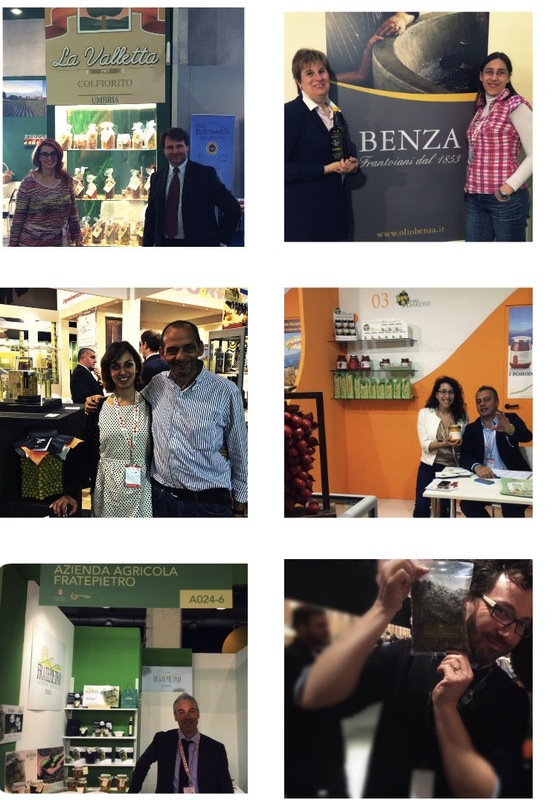 Together, we tasted the 2013/14 harvest Benza BuonOlio EVOO. It is always such a privilege to taste an oil with its creator. Claretta described her oil as round and delicate, with medium fruitiness, hints of light green olive leaves, and notes of pinoli nuts. This year’s oil is truly elegant. Farmer Francesco Vastola and his daughter Mariantonia (mid left) from Maida Farm have one thing on their minds this time of year: Artichokes. Farmer Francesco entertained us with videos of the artichoke harvest, what a process! Maida farm has been harvesting since early April and will continue until the end of this month. In fact, Francesco’s son was M.I.A from Cibus, we are told he is knee deep in artichokes in Cilento! Dario from Casa Barone (mid right with Gustiamo’s Danielle) also has one thing on his mind: Yellow Tomatoes, they are exquisite and their color is stunning. Spoiler Alert! Casa Barone’s Yellow Tomatoes will be making their big NYC debut at the Fancy Food Show this summer! Over in Puglia, Andrea (bottom left) from Fratrepietro Farm was delighting everyone’s taste buds with his Bella di Cerignola Olives. And when we got to Sicily, we ate Caperberries with Gabriele (bottom right) and talked about summer in Pantelleria, we’d love to go to see the Zibibbo Grape harvest this year! Grazie a Tutti! A great visit.